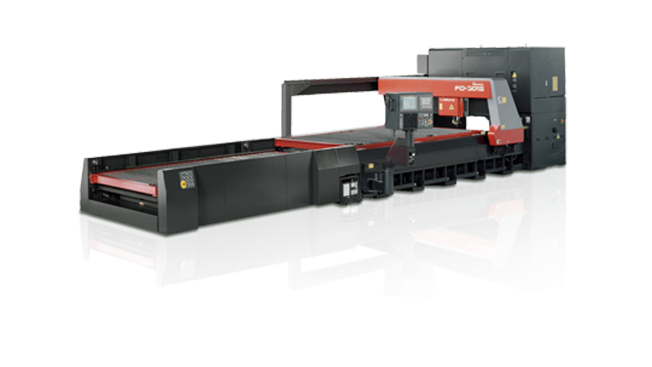 The FO series from Amada is filled with features that you are looking for in a laser machine, and the Amada FO2412 is included. The vibration is absorbed through its casting frame structure. With high speed processing, you get high accuracy. The laser CNC machine utilizes the lastest optical technology, A-O Unit. If the distance between the processing point and the oscilator, the focus of the beam remains constant. The assist gas pressure is automatically controlled no matter what sheet metal thicknesses, materials, or cutting methods you are using. SMP, sheet metal software by Merry Mechanization, handles the Amada FO 2412 laser cutting CNC machine very well, and can optimize the beam path effectively.